Horror film Ghost Theater, starring AKB48’s Haruka Shimazaki in her first independent role, had its Japan Premier on October 28 as part of the special event “Masters of J-Horror” at the 28th Tokyo International Film Festival. 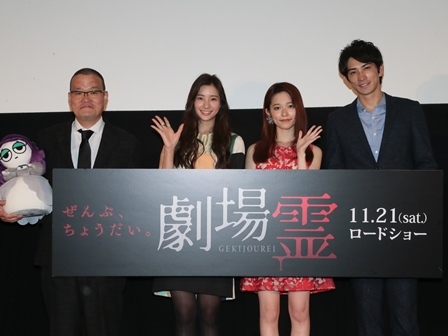 Actress Shimazaki was joined by co-stars Rika Adachi and Keita Machida as well as the director Hideo Nakata to present the film at Tokyo’s Shinjuku Piccadilly. In Ghost Theater, terrified actresses are haunted by a mysterious phenomenon in a closed space: playhouse. The film will be released nationwide from November 21.